This story begins with my asking my Facebook followers what recipes they’d like to see me create. One of the ideas came from super foodie Sharon Bradley Looper. She requested TAMALES! Tamales represent a challenge. 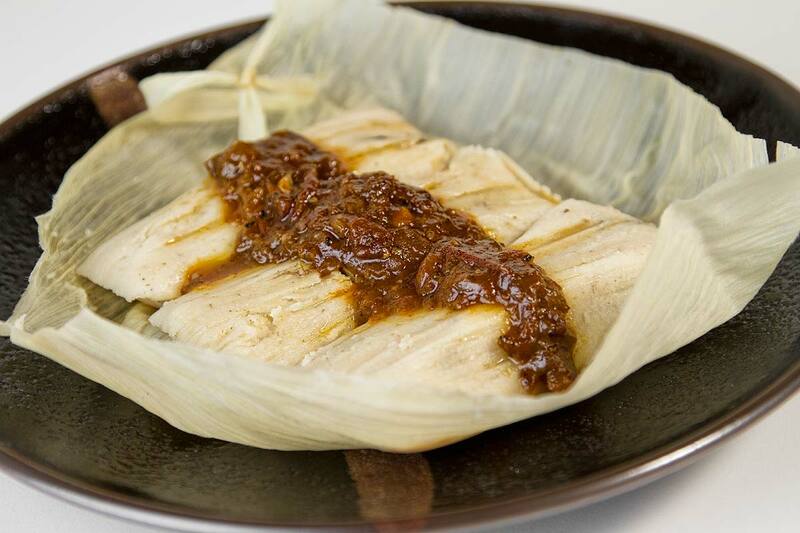 Making tamales without corn is like making bread without flour. I LOVED the challenge, but really wasn’t sure where to start. The seed had been planted. The recipe below follows Barbo’s recipe almost exactly, with the exception of the fat and filling. The filling is my own Mexican-ish Shredded Pork, and the fat I used was bacon fat, from the fridge. Otherwise … it’s Barbo’s recipe … and it was DELICIOUS! BUT WAIT! This isn’t where the story ends, my friends. There’s a twist! A few days after making the tamales, I wanted to check the carb amount of the can of hominy. I’d forgotten the amount, but knew it was either 3 or 4 net carbs per 1/2 cup portion. I picked up the can and took a gander. Holy Tamales! It was 16 net carbs per half cup portion! This was more than 4 times the carbs I’d thought they had. OH NOES! I’d known about the “Mexican Style” canned hominy for years. I read about it many times on LowCarbFriends.com. Ironically, living in Mexico, they were nowhere to be found! Sure, there was hominy everywhere. None of it specified that it was “Mexican Style”, but I could make the argument that all hominy in Mexico is “Mexican Style”. In any event, after a week of scouring every grocery store in the Los Cabos area for the mythical low-carb Mexican Style Hominy, I gave up. Cut to the present, I found the now legendary low-carb “Mexican Style” hominy on Amazon.com. The nutrition facts weren’t listed, but the lone customer review suggested that this was, indeed, the stuff of legends. I made the purchase and eagerly awaited my order. When it arrived, I didn’t even read the label, I simply popped the top and whipped up a steamed batch of porky goodness! After eating the tamales and having more “masa” still in my fridge, but holding another can in my hand reading that it was high in carbs, my shoulders sank and I knew there those extra few lbs. on my rump had come from. Infernal dastardly tamales! This sent me in a mission to figure out what had happened! I was able to find the nutrition facts for the Juanita’s “Mexican Style” hominy, which does state that it’s 4 net carbs per 1/2 cup. However, the can in my hand reads 16! What gives? Was it a typo for all those years? Then, I combed through miles of eBanter talking about the Mexican Style processing, which leaches the starch from the hominy. I read about how the canned “Mexican Style” hominy uses an heirloom variety of corn, which hasn’t had all the sugar bread into it, like today’s corn. (keep in mind, none of these “stories” would hold up in court) I also found others running into this same issue, with discussions that even followed up directly with Juanita’s. They never got through to someone with the information. A dead end. My theory is that they either recently corrected their mistake on the can, OR that they changed the formula, process and/or variety of corn being used. It isn’t clear to me that I have any way of knowing. This didn’t stop my search, though. I didn’t give up. That’s not my style. I forged ahead! I found that another company also makes the seemingly impossible hominy. Teasdale! I ordered some cans from them, opened the box and read. 4 net carbs per 1/2 cup portion. WHOO HOO!! EUREKA!!! I felt like I’d just discovered the mother load! I immediately popped the can and whipped up a batch of grits. YUM! Today, right now, I’m a bit miffed that the low-carb hominy from Amazon wasn’t what the doctor ordered. I also remain somewhat skeptical of the Teasdale brand, but … it does DEFINITELY say 4 net carbs on the can, and I HAVE read about the starch leaching process and about the heirloom varieties. Oh, how rationalizing is fun! I also want to point out that I unearthed a similar recipe while doing my research. This recipe is from another low-carb blogger and one whom I hold a lot of respect for. Her recipe is very similar, with one of the bigger differences being the use of canned baby corn, rather than full hominy. The American Diabetes Association states that baby corn is a non-starchy vegetable in their list, but … “Mexican Style” hominy is nowhere to be seen. Long Story Short: These tamales are every bit as good as they look, but the carb amount is up for debate. I suggest making these if you have a higher tolerance to carbs than I personally do, or for the occasional splurge. Do you have a cheat day once a month? Next time … try TAMALES! Clean the corn husks well. Rinse and brush away any old corn silks. Place them in a big pot of boiling water and let them stay for 20 to 30 minutes. This step not only cleans them but softens them. Take them out and pat dry with paper towels. Set aside. In the bowl of the food processor, place all the ingredients listed, except the corn husks, pork and sauce. Whirl this mixture until it is dough like. This takes some time and will depend upon your machine. Don't stop until it is like dough. Your shredded pork should be room temperature and separated from the sauce. If it is not, strain out the sauce (even squeezing the liquid out of the meat, if you need to). Divide dough into 12 balls. Spread 1 round of dough onto center of cornhusk. Drop a couple tablespoons of meat in center of the spread dough. Fold 1 edge of the husk to the center, and then fold the other side to cover entire tamale. Fold ends over by two inches or tie ends. As they steam, you can warm up the sauce. Serve the tamales with the sauce! Yep! I’ve still got two cans sitting in the cupboard, next to my one remaining can of Teasdale. What really burns me is … has it just been a typo all these years? Or, did they change the recipe? Inquiring minds want to know! i am almost certain that I saw a recipe for making tamales that used cauliflower as one of the main ingredients in the masa mixture. Sadly, I lost track of that recipe. If anyone can provide a link, I would be so appreciative. But reading this recipe made me think that perhaps using a combination of cauliflower with some of the baby corn, puréed, and blended in for true corn flavor might be a good way to go. But this will require someone with better cooking skills than myself to figure out the proper ratios. I’m just thinking cooked and well drained cauliflower, puréed baby corn, jack cheese, egg, and traditional masa seasonings? Who is up for the challenge? You would be my new best friend!